No one site can possibly contain all the information you might want about astronomy, and of course I stress the need to check outside sources. I have made a list of books (and a couple of movies!) I think best represent what Good Astronomy is all about, and, in association with Amazon.com, here is that list. Clicking on the links will take you to the Amazon.com website where you can read reviews and even order the book or movie. If you order the item through this link, I receive a small commission; it comes from Amazon's profit and not directly through you. 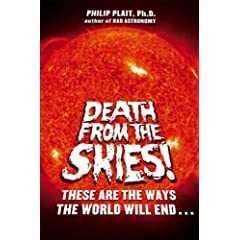 My second book, Death from the Skies!, is about all the ways astronomical events can wipe out life on Earth. From asteroid impacts to the eventual death of the Universe -- and everything in between -- this book gives you the real science behind cosmic catastrophes... and you'll learn that Hollywood generally underestimates the damage. But I also give you the odds of any of these events actually occurring, and that will show that... well, I don't want to spoil it. The book comes out October 20, 2008. Well, not to toot my own horn, but this is my very own book, based on the website you're reading right now. The book is a lot like this website, though with more detail. Some of the topics are the same, and others are in the book that I have not tackled here on the site. If you like the site, you'll like the book. Read more about it here! 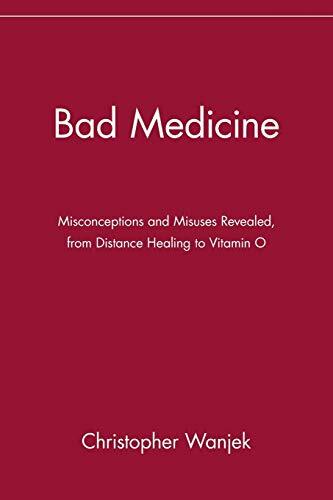 This book is the second in the Bad Science series (mine is the first), and deals with all the hokum and hoohaw about medicine. Can you catch a cold by going outside in the rain? (no) Does homeopathy work? (NO) This book is interesting, informative and funny. My only complaint is that it isn't longer! Of course you know the Astronomy Picture of the Day website, the biggest astronomy site on the Internets. And you may know they came out with a book a few years ago. Now they have another one! Astronomy | 365 Days is a worthy followup, with more devastatingly beautiful pictures of the heavens. I don't need to chat this up -- you want it. Buy it. My friend and colleague Martin Ratcliffe wrote State of the Universe 2007, a collection of the recent astronomical news in 2005 and 2006. He asked me to write a chapter on Bad Astronomy, so I did. It has the Bad Astro news from 2005, which was both fun and painful to write. As usual. This is an interesting book that has more info about the news than you'll get in the usual press releases. Not in Our Classrooms is an excellent introduction into how fundamentalist religions are trying to sneak antiscientific curriculum into the classrooms in America. Instead of attacking the ideas of creationism and Intelligent Design (which has been done elsewhere), this book documents how the ID movement is using misleading tactics (some -- including me -- might say "lying") to promote their own personal religion in direct violation of the First Amendment. No kidding, folks, this is a must read. As much as I wish Bad Astronomy were the most popular astronomy site on the web, it isn't even close. The Astronomy Picture of the Day site gets roughly twice as many hits as mine does. Every day, professional astronomers Bonnell and Nemiroff put up a new, beautiful picture of our cosmos with an explanatory paragraph. You can learn a thing or two from the writing, or you can simply gape slackjawed at the picture. It's a natural extension of their site to create a book, and what a book it turned out to be. They painstakingly picked their favorite 365 images and compiled a coffee-table book of surpassing beauty. Many of the images were re-processed for printing, making them even more stunning then they look on the web. Like the site, each image comes with a paragraph that adds wonder to the sense of awe, clearly and consisely explaining just what it is you are seeing. Many of my favorite astronomical images are included, and some I was surprised to note I had never seen before. This book is absolutely gorgeous, and it comes with my highest recommendation. Its smallish format (10x7 inches) does nothing to detract from the wide-scale feel of it, and if it had in fact been printed as large as a regular coffeetable book, no one would be able to lift its 365+ glossy page resplendence. At $29.95 retail, this book is an absolute steal, and if you buy it through amazon.com you'll save even more. This book will make the perfect gift for anyone you know with an eye towards the beauty of the heavens, and will inspire anyone who sees it. Michael Shermer is a well known skeptic and head of The Skeptic Society. This book is an interesting look into several unusual belief systems, including people who believe in mediums (like the execrable John Edwards) and Holocaust deniers. Shermer's book is an intellectual study inside these peoples' minds, and presents an honest and open look into the phenomenon. Hubble Space Telescope : New Views of the Universe by Mark Voit. Dr. Voit is an astronomer at the Space Telescope Science Institute and also a friend of mine. He has an excellent grasp of what to say to complement the gorgeous Hubble images presented in this beautiful book. It's an oversized softcover book and is perfect for thumbing through and perusing the pictures. 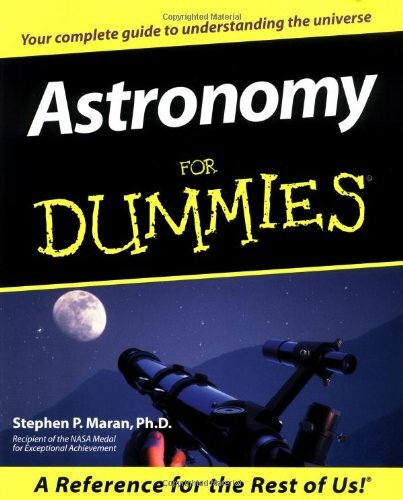 Astronomy for Dummies by Stephen Maran. I am very proud to have been the technical editor for my friend Dr. Maran on this book. 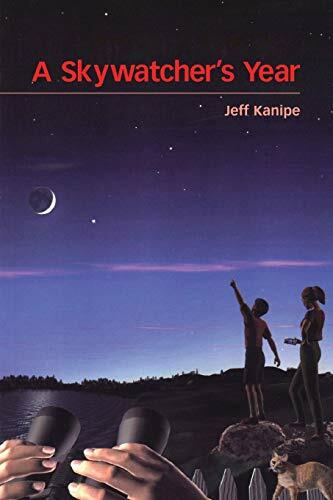 It's a fun, easy-to-read basic book about astronomy, both for people who are curious about the subject and for people who are curious about becoming amateur astronomers. Dr. Maran has a lively sense of humor, so you'll really enjoy going through it. A Skywatcher's Year by Jeff Kanipe. Former Astronomy Magazine editor and now a regular contributor to www.space.com, Jeff Kanipe knows his way around the sky. If you read his book you will too. This book describes the night sky in very convenient form of a week-by-week celestial diary. Each entry describes what you can see with your naked eyes or with binoculars, including both north and south hemisphere objects. There are also sections about observing the Moon, Sun and planets. This is a great book for the beginning amateur astronomer. Magnificent Universe by Ken Croswell. This book is one of the most beautiful astronomy books I have ever seen. It is an oversized coffeetable book filled with stunning color images of gorgeous astronomical objects. It's a bit pricey, but well worth it if you want something that will inspire your mind. I was the technical editor on this book as well. No book better represents my own philosophy and the philosophy of this website. In my opinion Dr. Sagan's finest work, this book explores the pseudoscience so rampant today, and uses rational thinking as a weapon against it. The chapter titled ``Baloney Detection Kit'' is both moving and wonderful, and required reading for anyone who fancies themself a rational thinker. This is also available in paperback. This is the fiction novel of our first contact with an alien race. The book is much richer in detail and imagination than the movie, and the end is, to me, very cool (and different than the movie too). You can order the movie through Amazon.com as well (that link takes you to a widescreen VHS version; or you can get a DVD version). Planet Quest: The Epic Discovery of Alien Solar Systems by Ken Croswell. When I read this book, I was not certain what it would be like. I was very pleasantly surprised when I found it to be a well thought out and very readable account of how we as humans went from not understanding our own solar system to the detection of planets orbiting other stars. Since reading this book, I have contacted Dr. Croswell and he has helped me in my own writing, so it is with great pleasure that I can introduce some of my own Bad Readers to his Good work. This is also available in paperback. This is a beautiful coffee table book with stunning images of galaxies in it. I have a copy on my bookshelf and it is well thumbed-through. Two warnings: this is an oversized book, and may be pricey, but it is also out of print. If you go to the link above, Amazon.com will try to find the book at one of its listed used bookstores for you. Through the Eyes of Hubble: The Birth, Life, and Violent Death of Stars, by Bob Naeye. Bob is the editor-in-chief of Mercury Magazine, and has seen his share of Hubble images. He has collected some of the best in this book, which also has nice descriptions of the images as well. Bob was my editor for a year in the Ask Astro column of Astronomy Magazine, and again it's nice to be able to point my readers in his direction. Now, if none of these tickles your fancy, you are more than welcome to browse the selection at Amazon.com. The form below is a search engine that you can use to look for other titles at Amazon.com. I still get a commission from this as well, though it's smaller. Again, though, that money will go towards maintaining and improving this website. 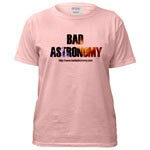 Amazon.com is pleased to have Bad Astronomy in the family of Amazon.com associates. We've agreed to ship products and provide customer service for orders we receive through special links on Bad Astronomy. Amazon.com associates list selected books and music in an editorial context that helps you make the right choice. We encourage you to visit Bad Astronomy often to see what new items they've selected for you.